In a rousing speech to the Transportation Advocacy Group – Houston – an entity that lobbies for multimodal transportation funding – Houston Mayor Sylvester Turner presented a vision for high capacity transit, safe streets for all people to comfortably walk and bike, city policies that support walkable urbanism at the high speed rail station, and city policies to prioritize bus transit on its streets. 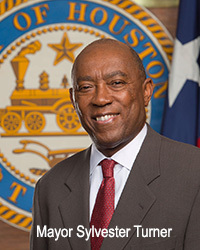 Mayor Turner then finished his speech with a forceful denouncement of sprawl road building and an extraordinary challenge to the region’s 133 other towns and cities and 6 counties to work together through the regional government, the Houston – Galveston Area Council to develop a sustainable, resilient 2045 Regional Transportation Plan. “I would like to leave you with a last thought about the resiliency of our region. Resiliency and mobility are inextricably linked. In a post – Harvey world, we know we must use smarter transportation policy to create a region that is less prone to flood risk. Since I came to office, I have been pushing all of our partners for a paradigm shift in transportation investments. Focusing our transportation investments in the core of our region, rather than the periphery will make a more sustainable, less congested, and more resilient region. In the past five years, over 50,000 acres of land are now experiencing development activity within three miles of the recently completed segment of the Grand Parkway, and much of these developments drain to Buffalo Bayou, Braes Bayou, Cypress Creek, and Greens Bayou. That means that over time, these channels will experience and even greater volume of runoff than they do today. Yes, I understand that these developments are required to provide detention for their runoff, and yes, there are drainage improvements like channel widenings or new detentions ponds or reservoirs that will part of that solution. Still, Hurricane Harvey was a watershed moment for this City. This event demonstrated that we have to be smarter about our regional transportation investment strategy. The strategy of building new freeways through vacant lands as a means to open land for development has serious consequences. It requires serious regional planning. Urban sprawl comes with a cost. Focusing on the core would create a more sustainable, more resilient, and less congested city. Houston’s future must be building up, not necessarily out, to sustain our success. I am challenging our entire region to work together in this direction. As the Houston – Galveston Area Council develops its 2045 Regional Transportation Plan, I would like all of our regional partners to consider the lessons of Harvey and develop a 2045 Plan that fosters a sustainable and resilient region. Houston Tomorrow, the Citizens’ Transportation Coalition, and other organizations across the Houston region have long advocated for a greater focus on H-GAC’s RTP process from the City of Houston. One of Farm&City’s main programs focuses on sustainable regional growth policies, currently focused on the Austin region through our Growing Weirder project. This process is designed to be replicable to all Texas metro regions, and we have been doing as much as we can with our tiny budget to encourage and help more Houstonians be involved in the 2045 RTP process. We also collaborated with several Houston partners to develop a sustainable framework for responding to Harvey that includes a more holistic, equitable regional planning regime. Read more at RebuildTheHoustonRegion.org. How much of Austin is off limits to new housing through compatibility?